Editor’s Note: Self reliance, simply put, is the ability to find out for yourself the resources for your needs–both intrinsic and extrinsic. One of the best things about going to camp is navigating the ins and outs of each day without the sheltering presence of the family. 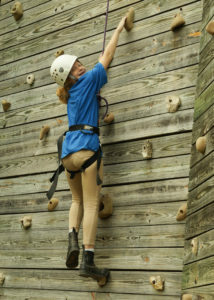 Camp is a place where girls are safe to try new things and fail, without being considered a failure. Each new skill mastered is the sole accomplishment of that child. Campers make friends on their own, make choices on their own, and learn to seek what they need. These are some of the essential steps of developing self reliance. 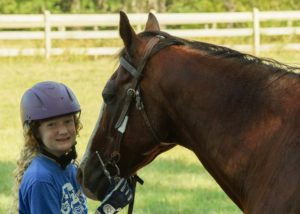 Camper Chloe B has discovered that horses are important for her sense of peace. We could tell you how amazing Heart O’ the Hills Summer Camp for Girls is, but that would be no fun. So we asked our Heart Campers to share their experience about camp. Periodically we post a camper’s “Heart Story”. We hope you enjoy reading how camp makes a difference in girls’ lives every day. “I’ve been riding horses for three years. When I’m with horses it makes me feel at peace. People say that doing yoga makes them feel at peace– so being with horses is my yoga! When I’m home in Alabama I’m able to ride horses once a week, but at camp I get to ride every day. Because of this, The Heart is providing a healthy atmosphere for me. I recently had a horse pass away and I still get emotional. When I saw Bandit at The Heart we had a connection. I keep riding Bandit because I feel the more you ride a horse, the better you can predict it. If you would like to share your Heart Story send it via Facebook messenger or email. We can’t wait to read it!